Local couple Brad and Nita Blomquist have spent the last year making handcrafted wooden gifts with original, environmentally inspired designs, all in an effort to help low wage workers in the Philippines earn a livable wage to help meet their needs. They call it Kalikasan Artisan Partnership. Hardwood trees are protected in the Philippines, so Brad pre-cuts the individual design shapes in Eau Claire, and then sends them to artisans in Bais City, Negros Oriental, Philippines, where the individual shapes are precisely sanded to fit together, then assembled and sanded again, completely by hand. The pieces blend maple, walnut, and cherry wood, all of which are grown in the continental U.S. The centerpiece of their products is their original “a.w.e. harmony” design. The pieces weave together a bird, a fish, and leaves to represent the elements that connect all people: air, water, and earth. 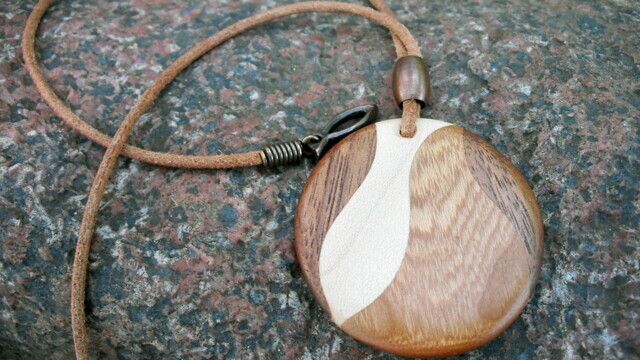 Fit together in a circle, the elements symbolize perfection and the interdependent harmony with nature. Currently the design is available in coaster or pendant form, but the couple plans to expand their line in the near future. The goal is to support a movement to protect our planet, so 5 percent of sales go to environmental organizations in the Philippines and the U.S. Kalikasan’s products can be found at the Coffee Grounds, 3460 Mall Dr, Eau Claire. For more info, check www.artisanpartnersus.com.